We are blessed to see another full Moon. Blessed full moon a reflection of the Sun's glory. Set in the heavens to remind us that even in the darkest of hours we are not alone. 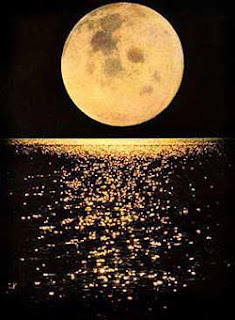 Some believe that the time of the full Moon is one of strength and a fullness of being. Set your goals, set your intentions during the time of the full Moon. Go out to her tonight and bask in her luminescence. Raise your hands to the heavens and affirm that you are...Affirm that you are blessed...You are blessed with abundance. Abundance comes in all forms. Abundance of Love. Abundance of light upon your path. Abundance of family and friends. Abundance in any area of your life including finances. What is it that you feel you need? You lack nothing. You must only trust that it is yours waiting for you to be open to it. Love, kindness, monetary help? Get out your paper and pen and write your check out to yourself during your time of the full Moon. Write out your desire....payable to you. Trust in your intention to receive blessings from the Source of Life. Trust and do not worry. Continue about your life and seek a way to incorporate that blessing in your life even before you "see" it. Whether it is discipline-- incorporating habits that will open the gates. Enjoy this beautiful full Moon you see today, at this moment...right now.